I just finished packing for our upcoming trip to Singapore, but I am so excited about this discovery I want to share it with you before I go on with my trip. I’ve been to Singapore many times already. At least 4 times when I was still working in Malaysia, friends and family would visit me and my wife and we would accompany them to visit Singapore for a couple of days. When I shifted my career from IT to entrepreneurship, I now visit Singapore for business. The first one was to celebrate one of my friends’ promotion to one of the leadership positions in our company. During my short stay, I got the chance to meet and share my story to OFWs who were also aspiring to become entrepreneurs. The last time I was in Singapore was around this same time last year when we received an award as one of the Top 25 Highest Income Growth Earners in the whole Pacific Region for our company. This time we are going to Singapore once again. We opted to stay for a little longer to enjoy and have fun in Singapore. I’m also excited because one of those I met in through this blog 5 years ago are going to be awarded on stage this week. They have completed their project of earning $2,000 (USD) per week for 4 consecutive weeks. It’s going to be 7 days of fun and excitment being with my friends and teammates. A lot has changed in the last 5 years. If I hadn’t gone into business, most probably it would be an uphill battle to get approval for vacation leave for my 7-day Singapore trip considering that I have 2 or more week-long trips again in the next coming months. Here’s our team’s group picture in Universal Studios Singapore last year. One thing that excites me about travelling abroad is I get to meet people from different countries. During the week I will be attending our company’s Asia Pacific Convention. It is another chance to meet and greet old friends as well as meet new ones from other countries like Korea, Japan, Hong Kong, Australia, New Zealand, Malaysia, Hong Kong and more. 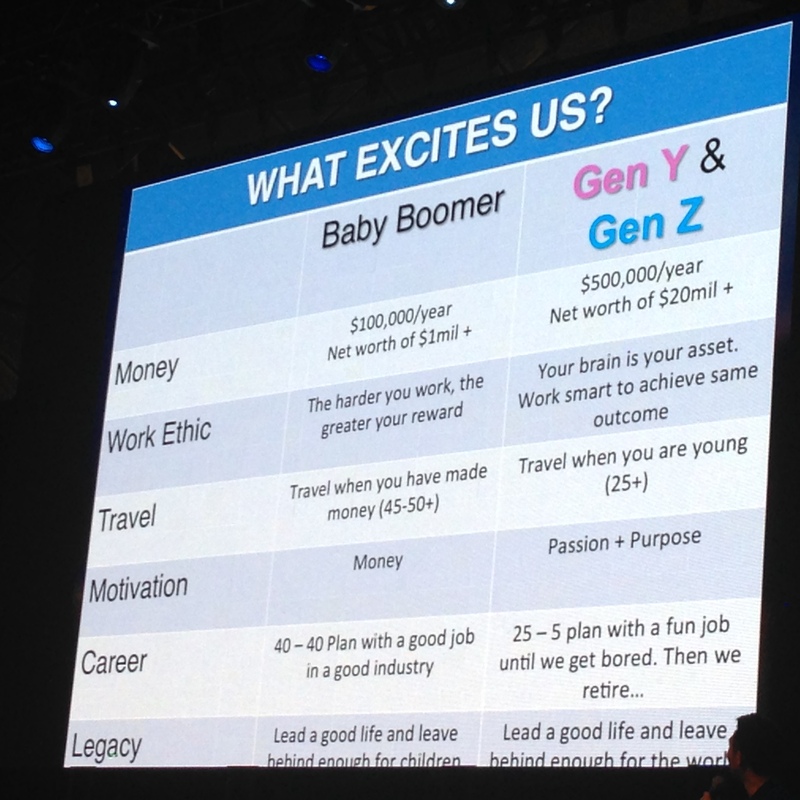 Last year, one of my friends from Australia, a Gen Y leader himself, shared this amazing comparison on what excites people from different generations: Baby Boomers vs Gen Y/Gen Z (Millenials?). This is an interesting comparison on what excites different generations. Baby boomers are people who were born in 1946 to 1964. This is right after world war 2. The soldiers went back home after the war and there was a population explosion. One billion people in one generation. This generation, is one of the biggest and they control a third of the world’s wealth. Generation Y are people who were born mid 1970’s to 1994 while Gen Z are born 1995 to 2012. These is a contrast between old and new generations. I can definitely relate to most of those in the list for Gen Y. Now, I can understand why people think Gen Y are lazy. The reality is that Gen Y know your brain is an asset and you should think of way to achieve the same outcome faster, cheaper, easier. That’s working smart. One of the reasons I shifted my career to business was because I no longer feel that I was growing in my job. I felt like I was just going to the office, put my 8 hours and then go home. Nothing to look forward to. Nothing to be excited about. I was slowly losing my soul. The first few years in my job, I was very excited to learn. After 9 years of doing the same thing over and over again, I felt bored. The pay was good, but I felt like I wanted more out of life than merely earning an income. I felt there’s an exciting world out there. There are so many things to explore. Exploring entrepreneurship felt like an exciting new frontier for me. Everyday was a learning experience. New people to meet. New ideas to master. New books to read. New places to go to. It’s been a wonderful experience being in business. It’s not without challenges, but I can never say it is boring. 🙂 Everyday is a chance to learn something new. I am a LEARNER by heart. I love to tinker with things. I love to explore and learn as much as I can. That’s what excites me every day. That’s why one of the things I loved doing in the past was reading other blogs about money. That’s why I was delighted to learn this amazing news a few weeks ago. This blog, Rich Money Habits by akosiallan.com was included in the Top 40 Business Blogs of the Philippines according to apexgloballearning.com. I feel honored to be in the same list of some of the best business authorities and blogs in the Philippines like Entreprenuer, Go Negosyo, Money Sense, Pinoy Money Talk, and more. It brought me back to where this blog started more than 5 years ago. I wrote the articles in this blog primarily to share my discoveries about money to the world. Most of you, I will not have the chance to meet. Through the articles in this blog, I hope it will help you in your financial journey. My dream is to hear your personal story one day, and get to share in your discoveries too. This world is a magnificent place to discover so many wonderful things. Now, it’s time for me to explore and learn from Singapore and the whole world! P.S. If you’re based in Singapore and you would like to meet me up in person, you can message me through my Facebook Business Page @ http://www.facebook.com/allaninocente111. See you there! P.P.S. I’m still looking for 10 people who would like to be part of my newest project. Part-time or full-time are welcome. Earn in US dollars. 2 slots have already been taken. 8 slots left. CLICK HERE and let’s connect!